Everyone’s talking about The Artist – the awards-tipped nearly-silent movie starring Channel 5’s The Hotel Inspector and the bad psychic from Phoenix Nights. That’s partly because the film’s very good, but also in no small part because it uses technology no longer common in mainstream cinema – silent film, black and white, 4:3 aspect ratio. That got me thinking about different it is in the world of games, where old fashioned has been borderline-trendy for some time. It helps that old for games isn’t actually that long ago; we have an established word for it – retro; and natural, relatively high profile places for it to reside – mobiles and downloads. On the App Store alone this week we’ve had the Tamagotchi faithfully resurrected as Hatchi, and Jeff Minter’s latest retro-tinged thing Caverns of Minos. Anyway, onto some not-very-retro mobile games. Less is more, or more is more? 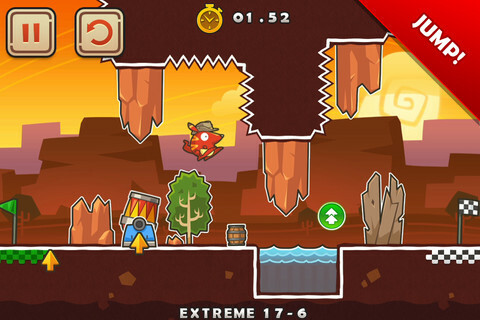 5TH Cell have both angles covered with this micro-platformer, their first new IP since Scribblenauts: levels typically last 3-5 seconds, but there are hundreds and hundreds of the things – and ten more added every week. Standard levels come in groups of 15, each of which introduces a new element – fans, springs, double jump, etc. It gives the game a curious tempo, since each group of levels starts off simply to introduce the new element, then grows in complexity, bringing in combinations of earlier elements. So there’s a nice arc to follow even if you’re only playing for a couple of minutes. The standard levels are, however, distinctly on the forgiving side. In an attempt to balance that, each group of levels successfully completed spawns a set of extreme levels, which demand an awful lot more precision. There’s probably a more satisfying solution somewhere, but it’s better than blocking progress with unreasonably tricky levels. A competitive version of Tiny Wings? Why not! Starring Woody Woodpecker? Er, okay! The similarity to Apple’s game of the year is clear to see, but putting a racing game on top of the ‘tap to fall, release to fly’ mechanic is a fine idea. 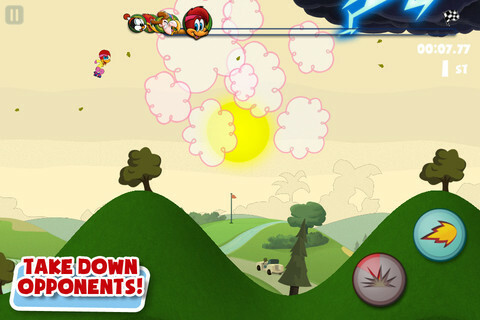 The addition of recharging power ups and various obstacles differentiates it further. And for the most part, it works. It looks suitably smart, and the simple controls are eminently effective. It’s in the little details that it falls slightly short: your view of the level doesn’t always keep the ground in good sight, and given the importance of hitting a nice downward slope, that’s not ideal. The placing seems to go a bit wonky on the final sprint to the line too: places are often gaining without overtaking anyone, even after crossing the finish line. Following success on Windows Phone, Replay Games have brought Vanessa and Her Elaborately Named Game to iOS. Bad Pilcrow’s platform-puzzler has an interesting conceit: its levels are mapped onto the sides of a cube, and to get to the exit you have to rotate the sides, changing the direction of gravity, and opening and closing passages between the sides. Once block moving puzzles, keys to collect, and dangerous spikes are introduced, it hits a difficulty sweet spot, and it’s all rather enjoyable. 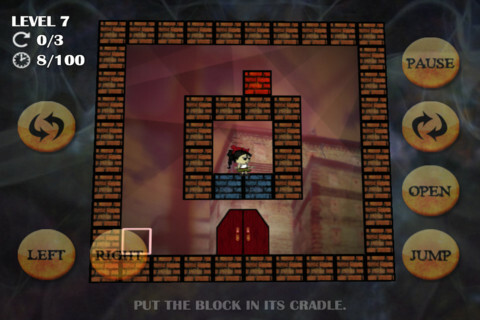 Towards the end of the game, adding spiders to avoid and relying more on platforming elements takes it a step too far. The problem with the platforming side is one of precision: the controls are bafflingly laid-out (see screenshot) and a tad unresponsive. It’s a lower resolution affair than one has come to expect, though the art style is quite nice. It’s also on the short side at just 36 levels, and an inconsistent star-rating system limits the attraction of replaying.